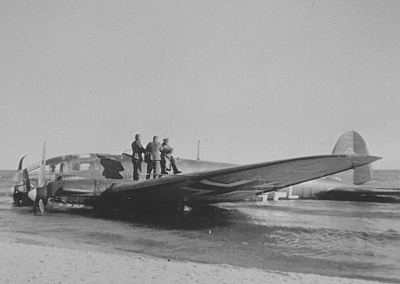 He 111P-2 belly landed on the island of Bornholm 21/4 1940. The aircraft belonged to 4. / KG 54 and was coded B3+LM. T/o Germany Op: Transfer to Norway ?. The He 111 was part of a formation of three aircrafts that at 19:15 hours had been fired at by flak when over the Swedish island of Gotland. Two of the Heinkels emergency landed on Gotland while B3+LM turned out to sea and reached the island of Bornholm where it belly landed in the sea just of the beach at Dueodde. 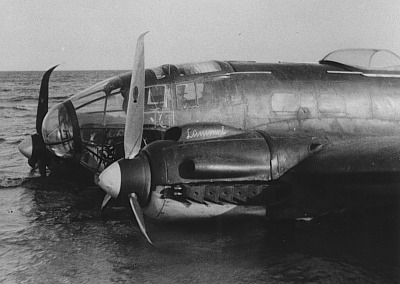 The crew were unharmed and the He 111 which was nicknamed “Lümmel” was not much damaged. 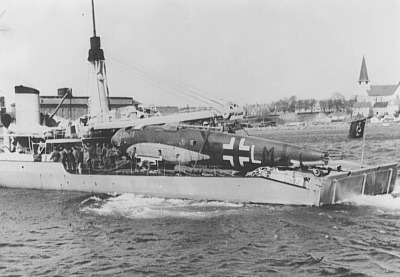 It was dismantled and brought to the harbour of Rønne where it was loaded aboard the Luftwaffe ship “Günther Plüschow” and brought to Germany. Sources: Niels Christian Pihl, “Luftwaffe in Sweden”.